Heat oven to 350 degrees F (177 degrees C). Line two baking sheets with parchment paper. Add raisins to a small bowl then cover with hot water. The hot water helps the raisins to become plump and juicy. Set the bowl aside for about 10 minutes. In a large bowl, beat the room temperature butter and sugar with a hand blender until creamy, about 2 minutes. (You can also use a stand mixer fitted with the paddle attachment). Add the egg and 1 1/2 teaspoons of vanilla extract then beat until combined, about 1 minute. In another bowl, use a whisk to combine the flour, baking soda, salt, cinnamon and nutmeg. Next, add the oats then stir until well combined. Now, add the oat mixture to the butter and sugar mixture in thirds, beating after each addition until incorporated. Drain the raisins then gently press down or squeeze them to remove any extra water. Stir them into the cookie batter. (Use a spatula or spoon for this, not the mixer). Drop dough by two tablespoonfuls about 2 inches apart onto baking sheets. (You can also use a large cookie scoop for this). Then, wet the tips of your fingers with water and gently press cookies down until they are about 1/2-inch thick. 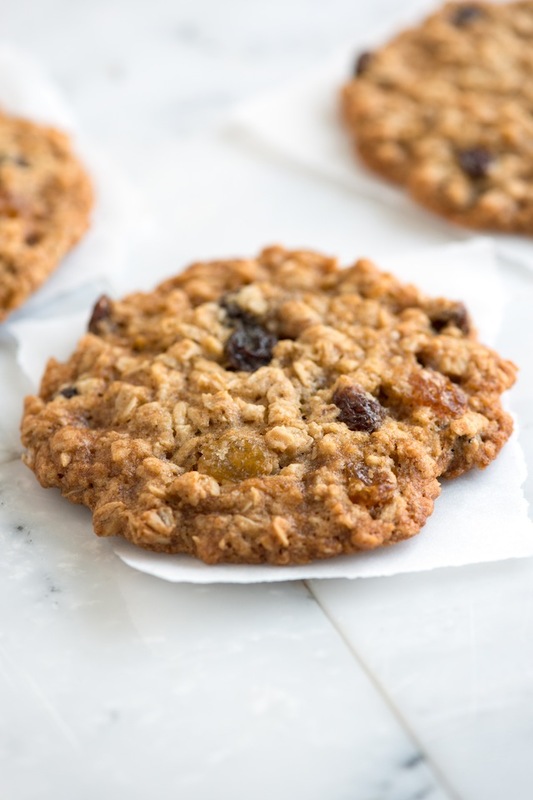 If some of the cookies have no raisins showing on top, steal a few raisins from the bowl and add to the tops of the cookies (they are prettier this way). Bake cookies 10 to 14 minutes or until the edges are light golden brown, the center is still soft. Cool cookies on baking sheet for 10 minutes then move to a cooling rack and cool completely.